One of the most recognizable icons of the sports coupe industry is the Mazda Miata. Officially known as the Mazda MX-5 Miata, this little two-seater has been wowing drivers for more than a generation and the newest model is the best one yet. With three trim levels available, the 2018 Mazda Miata has something for everyone. But no matter what trim you prefer, you will get an outstanding fuel economy. Every Mazda Miata model averages up to 35 highway MPG* with a 2.0-liter inline-four-cylinder engine. The engine is powered by 155 horses and produces 148 pound-foot of torque. Performance is the name of the game when it comes to the Miata, and you won't be disappointed with its smooth drive. There is much more the car has to offer. Read about it below. For the most part, all sports car drivers care about is performance. Does it go fast? Is it capable? Say no more. Well, the Miata offers so much more than a fun drive. Base features found on all models include LED headlights, MAZDA CONNECT™ infotainment, text message audio delivery and reply, and Bluetooth connectivity. It's no secret that technology follows us everywhere these days. 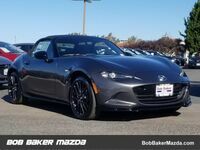 New cars come with the expectation of including modern technology and the new Miata comes packed with features that make your drive even more fun and convenient. Standard features on the Club trim include blind spot monitoring, rear cross-traffic alert, dual USB ports, and SiriusXM Satellite Radio compatibility. The Grand Touring, the highest trim level, comes standard with Mazda Navigation, adaptive front lighting, automatic climate control, an auto-dimming rearview mirror, and rain-sensing windshield wipers. 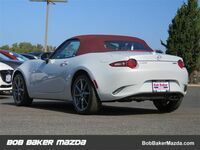 Interested drivers who would like to know more about this new sports coupe should contact Bob Baker Mazda. Our sales staff will go over all additional details and discuss financing and leasing options. You can also come take a carefree stroll through our showroom without any pressure. Whichever stage in the buying process you are in, we hope to see you soon!